Emerald Events joins the LDS Church at their church event today! Full of surprise, laughter, prayer, and attractions, they will bring their congregation together as one. As I have said time and time again, participating in group activities is an exceptional way to bring families together. The experiences we share among one another turn out to be the most memorable when including an activity that allows us to bond. Which is why members of the LDS Church has chosen our company to supply the event. When searching for family fun entertainment, there is no better choice than a game of Bubble Bumper Soccer! The game of bubble bumper soccer combines competition and hilarity among family, friends, or simply meeting for the first time. 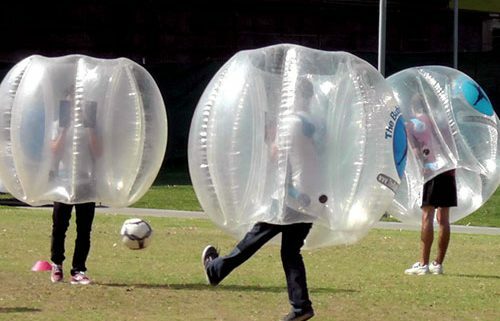 Bubble Bumper Soccer Package, which includes, goals, bibs, soccer ball, knee pads will be arriving at your church event! All of the staff here at Emerald Events wish you a fantastic time! We would love to assist on any organization event. Please call or book us online for any questions or concerns.